A cleverly executed show, Crime Doctor was never lacking in drama and intrigue. Ray Collins plays Dr. Benjamin Ordway, a criminal with a terrible case of amnesia after a severe blow to his head. After creating a new life and new identity (and recovering his memory with the help of a doctor), Dr. Benjamin Ordway goes into criminal psychology and becomes a member of the parole board. In early shows, twelve lucky jurors are selected from the studio audience to decide the fate of the criminal in each episode. Later, the show changed format. 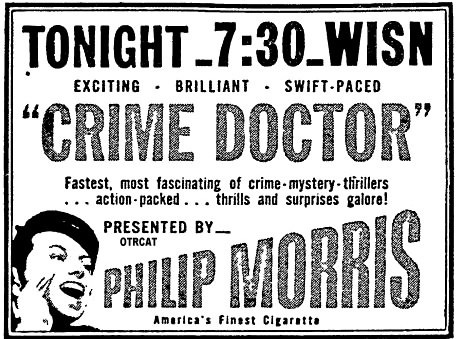 After the crime was dramatized throughout the first half of the show, Dr. Ordway would be called in to solve the crime with his specialized knowledge. Although the audience knew who did it and how, the trick was to figure out what fatal mistake each criminal made in order to get caught. Shows would break toward the end, just before the clue was revealed, with the announcer saying, "Ladies and gentlemen, in exactly 57 seconds, Dr. Ordway will be back to tell you the piece of evidence overlooked by the suspect. For more rare crime shows, see also: Rare Detective and Crime Shows Collection, Rarities: Adventure & Detective, and Dame Detectives, Female Crimefighters. Be the first to comment on "Crime Doctor"